Flight mach number Figure 4.6. Module configuration significantly affects performance. result, because it quantifies how serious the engine drag can be as flight speed is increased and why some historical engine programs struggled to exceed the Mach 10 to 12 regime. With a retractable vertical strut, it is possible to shift from the strut injector configuration to the wall injector configuration to maintain aircraft acceleration. If this configuration change is impossible, or is not made, accelerating much beyond Mach 10 is unlikely. 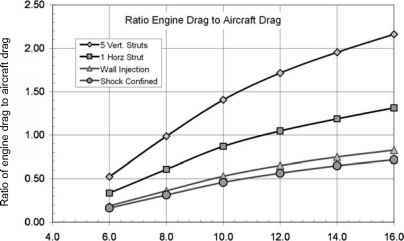 It is therefore clear why engines with retractable strut concepts [Baranovsky, 1992a, b; Vandenkerckhove and Czysz, 2001] are essential to high Mach number operation. The adaptation of the Swithenbank center strut to a wall-mounted vortex mixing injector represented a significant improvement. Swithenbank developed the single horizontal strut with the trailing-edge delta fingers so that a fixed strut had the potential to reach Mach 12. Townend's early pioneering in shock-confined combustion offered a significant reduction is propulsion system drag [Townend, 1966, 1985]. Ashford, and Emanuel, have compared ejector ramjet to the Oblique Detonation Wave Engine (ODWE). 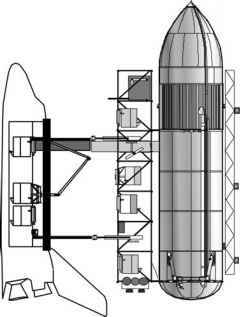 The ODWE can be one operating regimes of a combined cycle propulsion system [Townend and Vandenkerckhove, 1994], when internal drag of the engine module becomes so large as to significantly diminish thrust-to-drag ratio at high hypersonic speeds. The result is that propulsion acceleration specific impulse, or effective specific impulse, based on thrust minus drag, is the important parameter for accelerating vehicles, not specific impulse alone. We now have nearly everything necessary to determine what speed a scramjet-powered vehicle can reach based on available energy and thrust minus drag. There is one element missing, and that is altitude. Altitude is not limiting in the sense that combustion cannot be maintained; it can be limiting based on the value of the nozzle expansion entropy. Entropy is a thermodynamic quantity that relates to how much of the energy in the system is irreversible. That is, if energy (pressure) is expended to accelerate an airflow to supersonic speeds, then to slow it down the air must be passed through a series of shock waves. The entropy increase across the shock train determines how much of the initial pressure can be recovered. The greater the entropy rise, the larger the fraction of the initial pressure becoming unrecoverable (irreversible pressure loss). The same is true for any Brayton cycle engine (ram/ scramjets and turbojets are Brayton cycles). One characteristic of the atmosphere is that, as altitude is increased, pressure decreases. As pressure decreases, entropy increases; therefore for any propulsion cycle, the higher the altitude the higher the initial entropy in the atmosphere. Most Brayton cycles have a constant increment of entropy across the cycle, therefore the higher the altitude the higher the expansion nozzle entropy. That entropy level determines how much of the chemical energy added to the air molecules through combustion can be recovered as exhaust velocity. The reason the combustion energy cannot be recovered as flow kinetic energy of the gas bulk motion (or flow velocity) is that the entropy limits the internal energy of the gas (temperature) that can be transmitted to the gas molecules by collisions. The burnt expanding gas is said in this case to be "frozen", and will be colder compared to a gas in the opposite state ("equilibrium"), a state where molecular collisions, can indeed transform internal energy into velocity. Equation (4.7) gives the critical entropy value based on the physical size of the nozzle and its expansion nozzle half-angle [Harney, 1967]. In the equation, (S/R) is the non-dimensional entropy, d is nozzle half-angle, r* is the radius of an equivalent sonic throat that would give the nozzle mass flow and static pressure and temperature at the combustor exit, and r*ef is one inch (25.4 mm). If 10% of the chemical energy is "frozen" and cannot be recovered, there is a serious drop in exhaust gas velocity and a loss of thrust. Remember that in an airbreathing engine for thrust to be generated the exhaust nozzle exit speed must be greater than the flight velocity. For the case presented in Table 4.2 the exhaust gas speed is just 9.7% greater than flight speed for the supersonic through-flow case and only 3.5% greater than flight speed for the subsonic through-flow case, so any loss of velocity producing energy is critical at this speed. For a particular engine, given the initial entropy of the atmosphere and the entropy increment of the engine, the onset of "frozen" flow can be identified. With this understanding, and putting everything we now have together, the operating spectrum of a ram/scramjet can be determined.